Once a star has been observed, it is useful to plot its characteristics on a chart where it can be compared with other stars. Most commonly, stars are characterised from observing their luminosity (or absolute magnitude), spectral class and/or surface temperature. 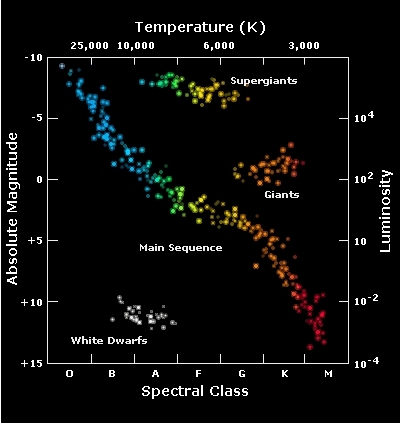 These quantities are usually plotted on a Hertzsprung-Russell diagram, in which surface temperature and luminosity are set out as a logarithmic plot on an X-Y axis. 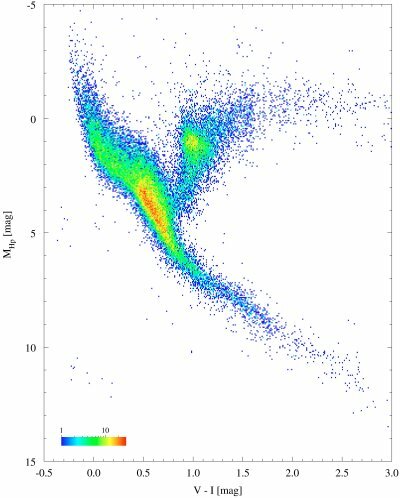 The diagram is named after Ejnar Hertzsprung and Henry Norris Russell who independently developed the plot in the early 1900's. Plotting the characteristics for a sufficient number of stars reveals groupings based on the stellar properties. The majority of stars are to be found on the Main Sequence a narrow band running across the chart from upper left to lower right. Red giants appear in the upper right of the diagram, while white dwarfs appear in the lower left quadrant. Cepheid stars appear in the middle right of the diagram in a branch extending from the Main Sequence.